So, you are thinking about chartering a sailboat. Where do you start? “Sailboat” is such a generic term that it can convey a wildly different range of mental images, depending on who uses it. The truth is that there are many kinds of sailboats, with a variety of purposes and uses. If you are planning a sailing trip, knowing what kinds of sailboats are available and which will fit your needs is very important. Different types of sailboats are distinguished by their rigging (including the number of sails and the placement of the mast) and sometimes the shape of their hull. It is possible that you have heard some of the terms defined below, but not applied to a specific context. This guide will give you an idea of the options that are available and what they are best used for, so that when you start your sailing adventures you will know what you are getting involved in. The word dinghy is most commonly used when describing a small power or rowing craft that is towed behind a boat, but dinghies are also a class of sailboat that started to rise in popularity towards the end of the 19th century. They are small sailboats, with one or two sails. Dinghies are often used for racing and learning to sail, so if you are looking for some fast-paced adventure or a great way to learn the ropes, a dinghy may be the type of sailboat for you. They let you have an up close and personal experience with every aspect of sailing them. 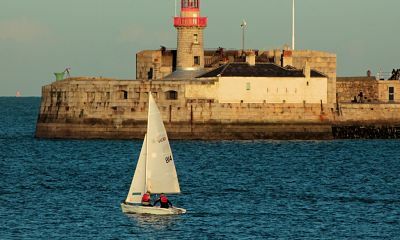 Popular types of dinghies include lasers, 420s, and optimists (especially good for children learning to sail for the very first time). Originally used by the French Navy to run British blockades, sloops are among the most common types of sailboats — the word refers to a boat with a single mast with two sails, the mainsail and the jib. If you are looking for a bigger boat than a dinghy, this is the simplest and easiest to sail. They come in all sorts of sizes and varieties — so many, in fact, that they will not be listed below – and are well adapted to fit the needs of any beginning boater. Sloops can be suitable for cruising, racing, or day sailing, and are in general the most common types of sailboats. In addition, they can be rigged to carry a spinnaker (the large, colorful sail that is placed in front of the mast for when you are sailing downwind) if you so choose. The term “ketch” describes a sailboat with two masts, where the second mast — called a mizzenmast — is located towards the stern of the boat, in front of the rudder. Ketches were first used as fishing boats, and their name has the same meaning as “catch.” The mizzen sail, which rides the smaller mast, allowed fishermen to pull in their nets without exposing the side of the boat to breaking waves. On modern sailboats, the advantage of the ketch rig is in breaking up the area of the sails, especially with regards to bigger boats. Dividing size between the main sail and the mizzen sail makes the work of trimming them less overwhelming, and the mizzen sail can be used in stormy weather were a large sail is more of a danger than anything else. For these reasons, however, ketches are more useful as larger boats, and may present newer boaters with unnecessary complexity that could take away from learning the basics of sailing. Yawls, like ketches, are sailboats with two masts. Like a ketch, a yawl rig was first used on fishing boats, as it presents many of the same advantages. Unlike a ketch, however, the yawl’s mizzenmast is located behind the rudder. The modern yawl was developed in the middle of the 20th century to take advantage of certain rules of yacht racing. They are fairly uncommon, but the smaller sail can help balance out the boat, keep it pointed into the wind while dropping anchor, or work as a storm sail. 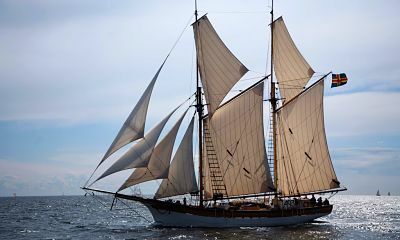 Though the image of a schooner may conjure up the image of a wooden ship from the Age of Sail, the term simply refers to a sailboat with more than one mast. Though they were among the most common type of boat used in the last few centuries, they are fairly uncommon nowadays. The difference between a schooner and a yawl or ketch is that the masts on a schooner are of equal lengths, though the forward mast may sometimes be shorter. This type of rig is used near-exclusively on larger boats. It allows for more sail area, but requires more expertise in handling than any of the other types of boats mentioned here. A schooner rig should be considered only if you are going for a large sailboat and need the extra sail or to break up the area of the sail. Another reason for the importance of knowing these terms and recognizing them by sight is that they are usually not said outright when talking about sailboats. You will hear people say “a catamaran” or even use specific manufacturer’s names like Hinckley and Concordia. Knowing the broad-stroke definitions of different types of sailboats will help you to narrow down the potential candidates for your charter, and will add much to your store of nautical knowledge. In general, a dinghy or a sloop is probably the best choice for a new boater. Both of these types offer a wide variety of models and a great potential for learning, and they are more widely available than the other types defined here. In the end, choose whichever type appeals to you most and which you think you will enjoy. As always, be safe, be informed, and enjoy your sail!